What's Happening in Pound Ridge? We're passionate about Pound Ridge history and strive to recreate meaningful slices of our own history every year. Here are some of our present and past endeavors. Please call us at 914.764.4333 to make an appointment. The exhibit highlighted Hiram Halle’s pivotal role in the development of Pound Ridge and its historical hamlet. Various aspects of Halle’s life were covered, including his many and notable accomplishments as an American businessman, humanitarian, inventor, philanthropist and arts collector. 2016 was the Pound Ridge Garden Club’s 75th anniversary. 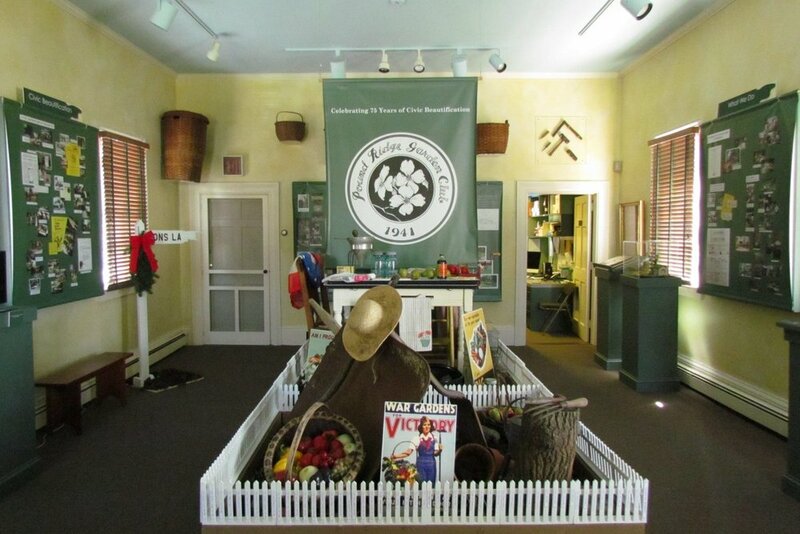 The exhibit that year honored their work and contribution to the Pound Ridge community from the time of their inception in 1941 when they joined the Federated Garden Clubs of New York State, Inc. and held their first show, “Victory Garden Harvest”, to the annual shows thereafter, as well as their civic projects. The Pound Ridge Historical Society opened Modern in Pound Ridge: 20th Century Architecture + Lifestyle on April 23, 2017. This was a real departure for the Society as the show featured the town's first comprehensive survey of Modern and Contemporary architecture as a part of our town's history that had been largely neglected.